At Hensler Furniture Restoration, craftsmanship is just as important today as it was in 1934 when Alfred Hensler started his furniture business in his parent’s garage. Pride in our craft results in a dedication of restoring your furniture or woodwork properly to return its value and usefulness to you. 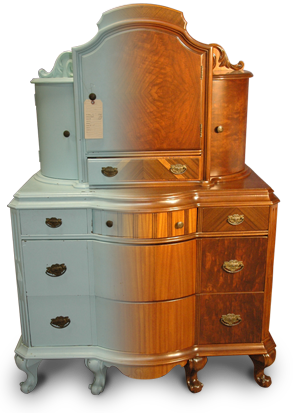 Over the years we have been involved with furniture restoration in architectural preservation programs of historical buildings, custom building of furniture and cabinets, woodie car restorations, and the restoration of tens of thousands of pieces of individually owned furniture from heirloom to investment quality furniture pieces. More than refinishers, the Hensler’s and their staff are experts in all areas of restoration. Whether it is a broken item needing repair, fire or water damaged pieces, custom part fabrication or custom building an item, Hensler’s can return your furniture to its proper appearance. Their work covers the Great Lakes Bay Region, surrounding communities, and areas throughout the state of Michigan. It has been our privilege to restore furniture that can be found in homes and businesses throughout the state of Michigan, many bordering states, and as far away as Texas, Florida, California, and Alaska. Your furniture is an investment, whether it’s a new piece or a family heirloom. If it’s damaged, worn out, or broken, it no longer is serving your needs. Whether your furniture needs to be refinished, repaired, rebuilt, new parts made, or restored due to fire, water, or moving damage, our craftsmen use skills learned from years of experience to restore your furniture back to its former provenance.